Looking for the best Dog Walking trails around Cookeville? Find the top rated dog walking trails in Cookeville, whether you're looking for an easy short dog walking trail or a long dog walking trail, you'll find what you're looking for. Click on a dog walking trail below to find trail descriptions, trail maps, photos, and reviews. Cookeville is a great town with lots of good scenery....but this trail shows little of it. Once you cross Washington and head east, everything is industrial. Took my 9 yr old riding last weekend. Parked at the Depot in Cookeville. The TN Central passenger excursion train was there....amazing to see it running with people going to Nasville. Rode all the way to Algood end. Flat, well marked, wide, 4mi ride out. Came back and ate ice cream at Ice Cream City downtown. Perfection! Bravo Cookeville. Cant wait until the Monterey and Baxter extwnsions open up. Nine miles of easy riding! For folks coming from Fairfield Glade this is very welcome. There are three access points with parking and restrooms: the depot end, the Algood Community center at the other end and Cinderella park about halfway on the trail. The scenery is not the best. That and the need more signage is why I rated it only four stars. The depot end is worth extra time for a stop for history and food. Overall, I like it and will do it again with friends. Congrats to Cookville. A Great resource for area residents. This review pertains to the 4.5 mile Cookeville to Algood section of the trail. My wife and I have biked this trail several times since before it even opened, and I love that we now have this local option - and in many ways, this is really a pretty good trail. But, there are real usability issues with it - thus only 3 stars. Quite gentle grades make this trail accessible to riders of all levels. The newly paved surfaces and upgraded wide sidewalks are a joy to ride on. Access is great - ample, safe parking at the depot, cinderella park, and Algood community center plus several minor access points mean that many area residents can get on the trail with little or no driving or parking issues. REAL bathrooms and water are available at the Depot and at Cinderella park. Some great trails are somewhat lacking in this department - Shelby park greenway in Nashville for example. 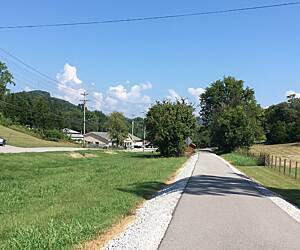 The Cookeville end of the trail passes through some of the more interesting parts of town and is my favorite section. Cinderella Park is just about halfway between the two ends of the trail - so parking there gives you the option of doing one half at a time - a good option if you are not in great shape, or if the temps are not ideal. The Cinderalla park trail head is a good place for a group picnic - with a nice basketball court, playground, grills, and a covered picnic shelter - to start or end a ride. First and foremost the street crossing at North Washington is not at all kid-friendly. Not very adult-friendly either. If there is a lot of traffic it can be pretty intimidating for many riders. Something else really needs to be worked out. There are several other street crossings - most of which - other than Fisk rd - are very low traffic side streets and really not a problem. But again kids need to be well supervised. None of the other crossings are nearly as troubling as N. Washington. I really enjoy this trail and its convenient location - but the truth is, that much of the scenery isn't very scenic. The old downtown district with the depot, historical buildings, and farmer's market and the cruise along the edge of the TTU campus is very nice, but other parts of the trail are pretty much the back end of steel commercial buildings. It's not a great negative, not trashy or unsafe - just not attractive scenery. Three out of five stars sounds worse than I want it to - I really like this trail being very close to my home. But if you have ever ridden on the Chattanooga river park trail or the Nashville Shelby park trail, or the Virginia Creeper trail you will understand why this isn't really a 4-5 star experience. Maybe someday it will be. Fingers crossed. Fun to See Nature by Bicycle or Walking! The ribbon cutting on October 18, 2016 officially opened our attractive Rail Trail! Come enjoy it if you haven't yet! When I rode it recently after a rainstorm, I saw a turtle crossing the trail near Algood in the late afternoon. Maybe we need a turtle crossing sign! I also saw a hawk fly overhead into the woods on the north side of the trail east of Fisk Rd. Pretty wildflowers and juniper bushes make it scenic. Come bike or walk! You'll have fun! 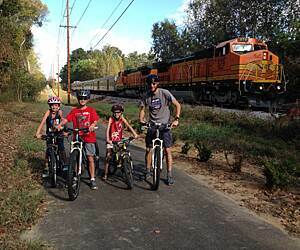 Thank you Rail Trail Authority for 11 years of cooperation and persistence! Thank you Cookeville, Algood, TDOT, Bill Drunsic of the railroad right of way, the state of Tennessee, Sen. Lamar Alexander, Michael Detwiler -- Rep. Diane Black's district manager, and donors for your support! We appreciate your efforts to help our communities keep active and get in shape year round! Happy trails to you! The Tennessee Central Heritage Rail Trail had its grand opening this past weekend (Sept 15th) and I had the pleasure of a round trip bike ride from Algood to downtown Cookeville and back. What a wonderful resource to have available in our community! Several individuals and families were enjoying leisurely walks and I passed a few other cyclists during my trip. The route is a smooth ride on the paved Rails-with-Trails route with a few sharp turns and occasional street and/or rail crossing. It is a very safe trail with all intersections clearly marked for both trail user and drivers. Elevation changes are gradual making this trail accessible for all ages and abilities. Future projects could consider garbage cans and bike racks. Also, be on the lookout for some fabulous art installations along the trail from Cookeville's own Brad Sells and ART (Art Round Tennessee)! I plan to use this trail for my daily bike commute from home to work. I encourage everyone to experience this lovely addition to middle Tennessee. As a full-time bike user who travels between Algood and Cookeville frequently (often more than once per day), I am excited about this path! I have tried to stay off of it until its official opening to the public, but I have heard from so many local walkers and runners that have been on it. This is a single-lane, paved path that follows a LIVE--but infrequently used--railroad track. It is very smooth and easy, but does not offer a tremendous amount of shade. This morning I used the section between Algood Park and Washington. There is some standing water and one section (about 50 feet) that needs to be paved. That section is easily bi-passed on a quiet parallel road. Two notes of caution: (1) the posts to mark road crossings are not in place yet (as of Aug 16) and (2) there are some sharp turns to cross the tracks so check your speed if you are on a bike. There aren't very many pretty views or photo spots along the trail yet, but give them time to open before judging the landscaping. The path does cross roads more frequently than I am used to from other Greenways (Nashville, Murfreesboro, etc). That is good for commuters like me to jump into traffic, but less good for family use. The path connects to a little playground (I don't know the name) with restroom access. This path will change my life. My hope is that it will be well used by everyone in the community. This morning I saw 6 bicyclists (one with a trailer carrying two kiddos), 2 walkers, and 1 runner using the trail. I also saw two small crews working today (on fencing and landscaping) and thanked them for their efforts. May I make a few suggestions? (1) bike racks at each entrance/park (2) a fenced dog park (3) a memorial or sponsored bench every 1/2 mile and (4) animal-proof garbage cans at entrance points (so the city can remove garbage easily). I beat the train today, but heard warning whistles during my errands. I will report back when the trail is complete and I have used it while a train passed. I'm sure all the cars on 10th Street are glad to have me off the road! THANK YOU COOKEVILLE, ALGOOD, AND TN!!! Well done! This is August of 2016, and my name is Gabby Lewis. We are a group of Christian ladies and friends, and we are THRILLED at the possibilities this trail has offered us for our daily walks! We have rode on our bikes, and just feel so BLESSED to have this wonderful trail in Cookeville! Carthage is one of the most charming towns in Middle Tennessee, but this trail--lacking views of the river--wasn't much to talk about it. The trail is paved with no steep grades, and I think it would be a great place to roller blade or for kids to bike. We walked it in May, and the honey suckle and other flowers made it a delight to our senses. We began at the Save-Way and walked south. There is a street to the west side of the trail, but the left is meadows and woodland. I spotted a bluebird, but not many other signs of fauna. I can't wait to get back to Carthage again, but I hope to hike along the river--or kayak it. I can't think of a reason why I would take this trail again. Looking forward to it! My great-grandfather worked for the TCRY for 55 years. It would be a privileged to bike this trail! What is the status of this project? Rode our bike there today. very short and easy . Good smooth trail bit boring, hopeful it is the beginning of something larger and nicer down the road.